Winter is a time for storytelling. This short but powerful thought seems simple enough but it's just one of the many things I've lost touch with over the years. It comes from the age-old idea that the winter season brings calm and is a time to reflect, gather, and share, whereas the summer solstice brings light and bright, energetic energy. Winter is my hardest and most out of balance season. Rather than being in balance with the earth and feeling the oscillation of the seasons and adjusting accordingly, I overpower my natural urges and force myself to keep my energy consistent and intense. This naturally throws anyone out of balance which brings me here, to Mii amo Spa in Sedona, where my bare feet touch the cool clay ground of a crystal grotto. RJ, the charismatic, Cree cultural ambassador for the property is leading us through a Winter Solstice ceremony where the scent of a mysterious mixture of natural herbs fills my senses as I wipe back tears. I was completely, and almost out of nowhere, overcome with emotion. How did I get here? Why am I here? And why am I balling my eyes out? I usually feel really inspired and moved when I travel but this trip was different. People come to Mii amo and Sedona to embark on a journey. It's not just a spa, but a place to go on an inner quest to pamper and encourage the mind, body and spirit. Sedona has incredible energy and they say healers show up on the doorstep of this canyon because they were called there by something bigger. I showed up on the doorstep having absolutely no idea what I was in for. I felt incredibly lucky to be in a positive patch in my life. I wondered what it was that I would get out of being here if I didn't have something negative or tragic to work on, but the universe works in very mysterious ways. It all begins by setting the intention of the journey and then picking 2 treatments a day. The vortex of the canyon crippled my iPhone and I was left, very happily, completely to myself. 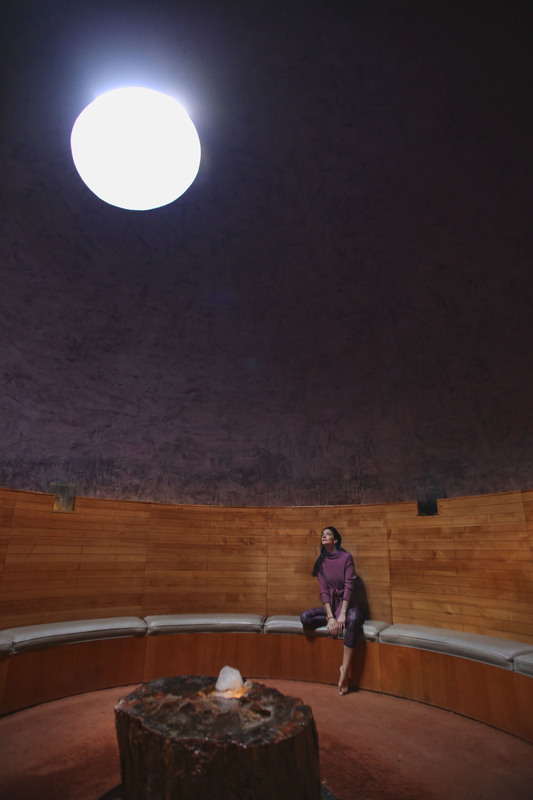 Every day started with a mediation in the crystal grotto, a spa treatment of choice, time for an optional activity like yoga or hiking the red rocks, followed by some delicious healthy food and then more treatments. I chose a journey that was filled with treatments that had Native American influence. My first treatment was Inner Quest, one of the more spiritually driven treatments. It involved burning sage and sweetgrass while I was wrapped in a Circle of Life blanket to signify the warmth of a sweat lodge. The therapist beat a drum and encouraged me to let my mind be open to visions encouraged by ancestors. Afterwards, I sketched what came into my mind during that time, unaware at the time of exactly what it meant. There was a dandelion blowing in the wind, the colors yellow and purple, a little girl running towards a pink castle and ship on the horizon with blue and white striped sails. I remember it so vividly even today. I was skeptical at first, not of the treatment, but of myself. I didn't think my mind could actually get to a place that deep and open. *And for the record, a week later after these visions I sat with my neice as she pulled up a show called Wishenpoof, about a fairy princess who makes wishes with dandelions, wears purple and lives in a pink castle-like house. I had never heard of that show before. Not a life-changing premonition but still a bit odd. What I realized as I embarked on the journey was that what was being revealed to me was clarity of path. Every single person I came in contact with there had the same message for me and helped me see that message for myself. I went in for my Ayurvedic facial and met a beautiful soul named Annie. I swear the universe put her in front of me for a reason. We talked and talked for the whole 90 minutes. She told me that I was a Vata dosha type and gave me two things to look into when I went home: One was Joseph Campell's Power of Myth and the other was Carolyn Myss' Anatomy of the Spirit. In a way it felt like therapy but with a really amazing facial as a bonus. She let me speak about my fears and my urge to not want things to be about me so much, that I felt like I wanted to help people. The message from her was clear. She saw me a healer or that maybe I was a healer in a past life or had a deep connection to wanting to help people. She finished off the treatment with a Shirodhara, which is an Ayurvedic treatment that pours warm sesame oil over the third eye. A warm sensation trickled down my spine and throughout my body and after those two treatments I was hooked and fully engaged in my path. I questioned myself a lot when I changed my blog. I thought people would think I was just following the trendy wellness scene or that everything is so narcissistic because it involves talking about myself SO much. To be honest when I showed up to Sedona I was just so darn burnt out from revolving everything around myself. This was on my mind when I walked into my Hozhooji treatment, another Native American inspired ceremonial treatment. The therapist sat me down and asked me to pick a color. For some odd reason I picked red and she wrapped tobacco into the cloth and had me tie it up into a little bundle while I recited what I was grateful for. This treatment focuses on the positive, she said. As she massaged my whole body she put the basket with my bundle on the floor for me stare at. She wanted me to get comfortable with my gratitude intention. For the first time, I said it aloud that I was incredibly grateful to be on the right path. All of the treatments and experiences thus far had proved that to me. She gave me the turquoise stone and tobacco bundle for me to take home. I hold onto it whenever I need to harness that energy. Every treatment and every therapist helped me reveal the same intention. When I spoke to RJ at dinner one night I was telling him just how much I wished I had a connection to my Italian ancestors like he does with his Native American ancestors. I literally cannot understand who I am or what the ancestors are trying to tell me if I don't know who they are. Of course, not even a few hours later I sat on the treatment table for my reiki/deep tissue massage. The therapist didn't say too much until after when I realized she had a very deep Italian accent. Her name tag said she was from Rome and her hands on me during the treatment felt motherly. She told me she noticed that I bite my nails and that my hands had an entirely different energy than the rest of my body. You are like a baby, she told me. You put in your mouth what you do not know. Try pottery or painting. Fuel that connection to your hands. I had just recently started painting with my fiancee. The sudden urge to create made sense. I also spent time with a woman named Bhakta who read my entire life through colored bottles (more on this in my next post). The outcome was the same. I was put on this earth to be creative and to be a messenger of healing. I will be forever changed by this trip and the revelations. It was in there the whole time just waiting for me to have the courage to face it. The best investment I can possibly make is in myself and I realized that looking deep into my heart and head should be done often, even when I don't feel like there are negative things happening. Celebrating and exploring the positive energy and listening to my inner instincts is the best exercise I can do for myself. What happened in that ceremony room on our last day during the Winter Solstice is forever sacred but I can tell you that looking around that grotto, everyone was struggling with some emotion. We then stepped outside for a solstice ceremony led by a few men from the Apache tribe. They only perform the dance outside. Freezing cold rain poured down as they embodied strong masculine mountain gods. The commitment to their culture and to nature made my heart happy. These quotes were left next to my bed every day. I had a folder full of them along with mantras and notes scribbled with wandering thoughts. I cannot say enough about how much I loved this place. The treatment rooms have views of the red rocks which have energy. The Sedona clay that was used in my clay wrap had its own energy. Every single thing is meant to have a message but it takes a true, quiet connection to self to understand it. If you're looking for a place to go with friends or even by yourself for some alone time, I highly suggest stepping into the canyon and into a journey. Here are some of my thoughts if you are considering it because the menu is extensive. The Journeys come in 3 night, 4 night or 7 night packages, all inclusive with 2 treatments a day and food included from the cafe. There's an organic farm on property and Chef Alex is really thoughtful about putting the menu together. You also get a special blue robe if you're doing a journey and they are heavenly. It's ok to not know what you want to get out of it. The canyon has a way of revealing things to people when they need it. Chat with the spa coordinator before your trip and ask as many questions as you can and just open up and trust the journey. Spend time hiking around Kachina Woman. We hiked to the end of the canyon which took about 3 hours round trip but my favorite part was the area right around the hotel. On my way home I had a stop in the Dallas airport and some time to kill. I decided to stop at a restaurant to fuel up and try to make sense of everything now that I was out of the energy of the canyon. For a split second I doubted myself again, after all of that work. I doubted my instincts and my path. As I waited to be seated they asked me if I was ok sharing a table with another gentlemen. I obliged and when I sat down he bought me some guacamole and struck up a conversation. He was a devoted yogi, a life coach for people who seek wellness as a career or be more wellness-minded. Without knowing anything about me he told me that he thought I was meant to be a messenger and communicator wellness just by reading my energy. He urged me to move forward with yoga certification and start a podcast, something Ive been wanting to do but never actually told anyone aloud, yet. My jaw hit the floor. I still swear this man wasn't actually real. I wouldn't be surprised if you told me he was a ghost. He is, in fact, real of course. The guy wrote a book about the 7 Acts of Courage, about leading a purpose driven life. You can read it here. Ok, universe. You have my full belief and attention.